Today we are joined by our sister, Mary Lyn Livingston. 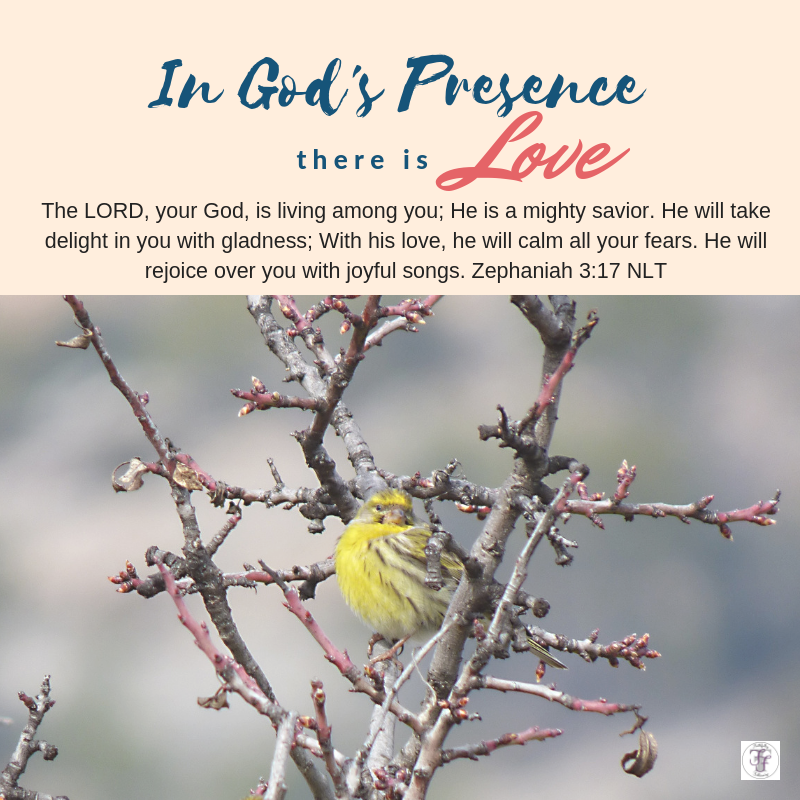 With a beautiful story, she reminds us that the Lord sings over us and in His presence we find love. We pray you are blessed. They were busy, just attending to life. I watched this pair of sparrows every morning as I walked under the sweet gum tree. The pair’s constant trips in and out announced that the eggs had hatched. A few days later a chorus of peeps was heard. Oklahoma is known for the constant southern wind roaring down the plains and the weather changing several times in one day. The weatherman just said severe storms were on their way with a wind forty to sixty mph. I decided to take a walk before the weather got worse. I noticed one of the baby birds in the grass. Just as she started to fly up into the tree, a strong gust of wind nearly knocked me backward and knocked her to the ground. My eyes glued to the scene being played out before me. I was afraid to move with the wind blowing harder as the sky turned dark. The little bird flew half way and fell back. Her chirps sent a distressed note to her father. He glided to her side chirping then flew back into the tree. The wind died down to its usual roar. The baby bird fluttered her downy feathers, shuttering as if to say “I can do it!” I saw her take off at the same time I felt another powerful gust. It appeared like she was flying in slow motion. She made it! The branch bouncing in the wind dipped down just in time. Hold on! Father flew to her side, offering fatherly sounds. She flew to an interior limb protected by dense leaves. She was safe. The father flew to the outer bough above her and started a beautiful song. “What would it take?” I asked the wind. My earthly father never says he is proud of me. He tells his friends of my accomplishments, making himself feel important, leaving me tasting failure. Today, I understand scripture’s truth. 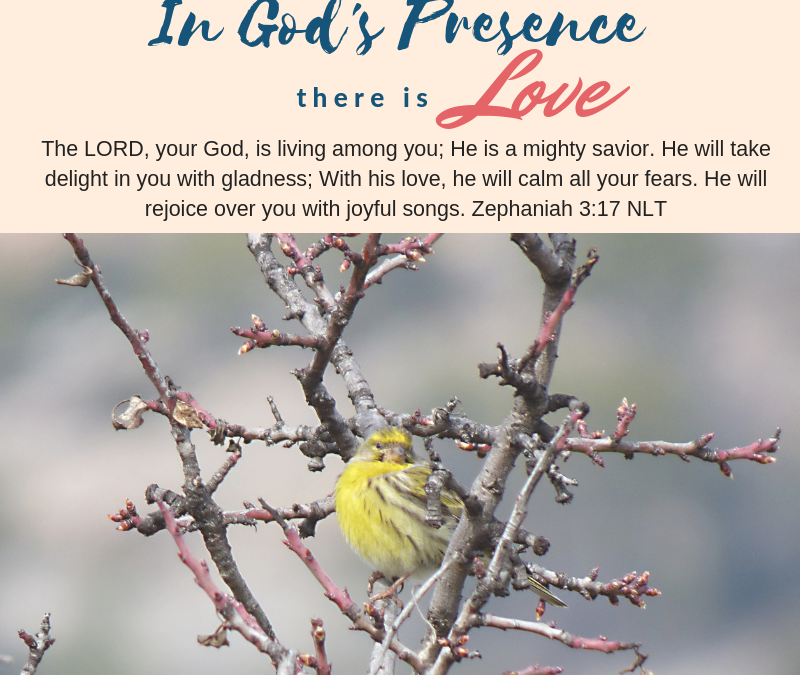 I watched scripture spring into life as a sparrow’s love song revealed how God celebrates over me. Decades of life happened before I appreciated how my heavenly Father loved me. Slowly, I began to realize He supported me all along, even in the seasons of darkness He was there. Thank you for loving us so tenderly. Your love is never failing, unlike any other love, we can experience. In the times we suffer from disappointment, fear, and a taste of failure, hold us close. Help us lean into you and trust that you love us. Has there been a time in your life when earthly disappointments or a taste of failure overwhelmed your soul and left you longing for love? Read Zephaniah 3:17 again. Insert your own name in the verse and ask God to help you trust His love. This morning in my IG feed I read, “Trust can also be translated” “to lean on” or “to place the full weight of my confidence upon” (Amy Kirk, IG follower). I smiled. We talked about confidence yesterday. Today we talk about love and when I read that trust can mean to lean on or place the full weight of my confidence upon I knew God was unfolding a story for our hearts to absorb deep. Are you longing for love, sister? Lean into God’s presence and soak up His deep love you. It’s waiting. We are praying that you, like Lyn, are encouraged by your Father singing joyfully over you. The Night I Didn’t Even Know I Needed To Be Brave! Thank you Jodie and Donna, I am so honored that you used my post today. My prayer is that it speaks to someone who needs to know the Father’s Love today.